Congratulations to "Brenda R.", the winner in Kim's giveaway. Thank you to all who participated! As an author, reader, and an artsy-fartsy graphic designer type, I have to admit it...I love book covers! I particularly love romantic suspense covers. Even though I try not to, I am guilty of judging a book by its cover. I'm sure I've passed on many fantastic stories after only reading the blurb simply because the book cover didn't convey the story inside. In my award-winning romantic suspense, REFLECTION, reporter Whitney Steel is investigating an alleged human cloning project when she meets up with the hero, FBI Agent, Blake Neely, who's searching for his own answers. Everything from this point on focuses on Blake and Whitney discovering whether or not the villain has produced the world's first cloned human. They don't set out to fall in love. A relationship between the hero and heroine evolves because of the suspense. How does an author and cover artist come up with a book cover that conveys both romance and suspense? My cover artist (Marion Sipe) began by gathering the perfect images. I loved the graphics. The DNA chain reflected the human cloning aspect of REFLECTION and the seductive image of the man and woman showed the book had a romance plot but the cover was missing something...an anchor for the suspense. So why is a good cover so important? Because a book cover is a window into the soul of a book, an author's first chance to impress by taking the reader on a visual journey. After: The final version was a perfect fit for REFLECTION. Florida investigative reporter, Whitney Steel, has lived in the shadow of her legendary father long enough. To prove herself she needs to find the “Big” story. Now it may kill her. After Whitney receives a lead pointing to the world's first cloned human, now a small child, she vows to unravel the truth. However, sifting through the facts proves to have dangerous results, including death threats and murder. When she's nearly killed, but is saved by undercover FBI Special Agent, Blake Neely, he refuses to let her get in the way of his own objective—at least not right away. Can they save an innocent child before it’s too late? Faced with tough choices, with deadly consequences for many—Whitney soon realizes that sometimes a story becomes more than just a story. 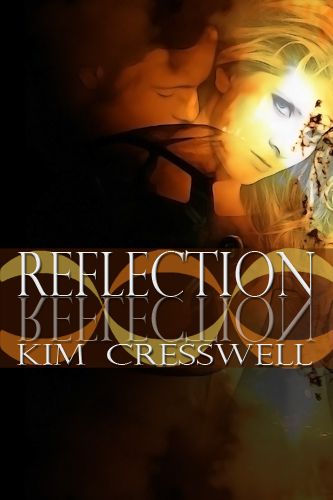 I will be giving away an eBook of REFLECTION to one lucky person leaving a comment. Giveaway ends 11:59pm EST July 10th. Please supply your email in the post. You may use spaces or full text for security. (ex. jsmith at gmail dot com) If you do not wish to supply your email, or have trouble posting, please email maureen@justromanticsuspense.com with a subject title of JRS GIVEAWAY to be entered in the current giveaway. As an avid reader, I also have to admit to judging a book by its cover. I love cover art and admit that is the first thing that attracts my eye and prompts me to pick it up to see what it is about. Marion Sipe did an excellent job on Reflection and I would have definitely picked up to see more, it is lovely. Thank you for sharing with us. Hi Denise. I'm so glad I'm not the only one who judges a book by its cover. I truly am a book cover junkie! I love spending hours admiring covers online (and buying lots of books-of course!). :) Thanks for your kind words about the cover for Reflection. Marion is a fantastic graphic artist. 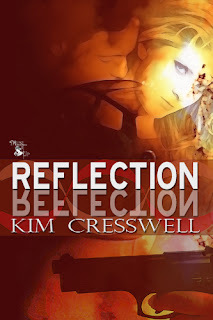 I must admit that the final cover for Reflections is terrific! I often pick up a book if the cover grabs me. If the blurb is also interesting, I buy the book. Reflections is definitely in that category. Being almost exclusively an eBook reader, I must confess that I don't pay much attention to book covers anymore... especially since I rarely simply browse for books anymore! My TBR queue is so epic and my list of must-read authors so extensive that I mostly rely on recommendations from fellow readers, authors, or book blogs like this one (or the barrage of review requests we get at the blog I review for) for new reads & authors. That said, I do appreciate a cover that matches the storyline, even if I only really look at it out of curiosity after I've read the book... thank you Kindle for opening the book at the first page of text! Being a molecular biologist, I like the DNA on the original cover, but the gun on the new & improved cover definitely makes the suspense come across more clearly. Looking forward to adding this to my TBR queue! I have certain authors that I will buy their book no matter what the cover, but when I'm browsing the cover is what first catches my interest and gets me to read the back cover. Congrats on the book. Would love to read it. If the author is an unknown for me... the cover can influence me... if it is something that catches my eye... I will then look at the blurb and see if it sounds like something I will enjoy... The cover for REFLECTION is definitely eye catching! I do judge by the cover - to my daughter's dismay. I'm attracted, I investigate further. Hi Mary. :) lol. Good luck with the giveaway! Hi Natalie. I do the same thing when I'm reading on my ereader or tablet. lol :) Have to see the covers! I don't notice the covers as much when I'm looking for a particular author but when I am just browsing I will pay most attention to books with covers I like. Thank you! Good luck with the giveaway!